Betz Family Winery was founded in 1997. The winery produced its first vintage that same year, one hundred and fifty cases of the 1997 Alpha Cabernet Sauvignon. In 1999 winemaker Bob Betz made the first vintage of what would become two of his signature wines – the Bordeaux blends Père de Famille and Clos de Betz. On initial release, the winery envisioned the Clos de Betz as follows: "Clos de Betz is the softer, earlier-maturing companion to our sturdier Cabernet Sauvignon Père de Famille. The mix of vineyards and varietal percentages change each year, but we blend Clos de Betz for the common threads of rich, sweet red and black fruits and up front appeal." 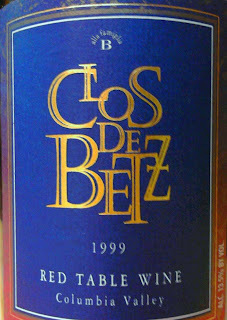 Full Pull Wines poured the 1999 Clos de Betz recently at one of their Thursday pick-up days. Bob Betz’ deft touch was already apparent in this wine, reminiscent of a Bordeaux with considerably more fruit on the palate. While I cannot speak to the wine’s up front appeal, I can say that ten years in it is showing beautifully with a few years left on it.